Come by from 4:00 to 5:00 p.m. and play an awesome card or board game with the Teen Librarian. This session we will play One Night Ultimate Werewolf. 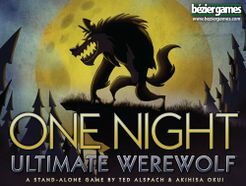 One Night Ultimate Werewolf is a fast game for 3-10 players in which everyone gets a role: One of the dastardly Werewolves, the tricky Troublemaker, the helpful Seer, or one of a dozen different characters, each with a special ability. In the course of a single morning, your village will decide who is a werewolf!